Page Updated Tuesday, December 30, 2008. 2) Forging light weight blacksmith tongs. A one-day course. Date: Tentative date is spring 2007. We may be filming this class for use in an upcoming instructional video to be available to everyone, and photographs from this event will be used for a webpage teaching new smiths to make their own tongs. More classes will be announced later. For an example of the work done by the past class, see lower on this page. Proper fire use to be emphasized at this class! Everyone that has attended classes in the past has demonstrated improper fire maintenance, with the exception of one student, and he had never been taught blacksmithing before! This will be remedied. We will be teaching and enforcing proper fire tending throughout this class. Beginning on Friday night. Setup is the night before the class (if you are bringing a forge) so we can make sure all the forges brought to the seminar, are working. The class will run one full day on Saturday. This should be enough time to make one complete tongs. This is more advanced than making fire tools and the smiths will need some prior experience at handling the fire and attended the basic blacksmithing class. Hands-on training begins Saturday. We will be making plain flat jawed tongs from bar stock. At top right of page is an example of light tongs made by the author. These tongs will be forged from solid bar (sizes of stock to be announced, may vary from 3/8th x 1, 5/8ths inch round or 3/4ths inch round). We will be making them from 5/8ths or possibly 3/4ths inch round bar in the upcoming class. Participants will learn to make their own tongs from scratch and will keep the tongs they make in this class. We will need these tongs when we start making animal heads in later classes. In the photo of tongs at top right of page, there are two sets of three ranging in size per set, of 1/4" to 3/8". The offset of the handles near the rivet boss, in the group at right of photo, is useful to make the tongs more comfortable when gripping them closer to the jaws. Both types are a pleasure to use. We will be making the style seen on the left side of the photo. While they can be made without the use of a power hammer, we will use a Little Giant 25 lbs. hammer to speed things up. What are light tongs? 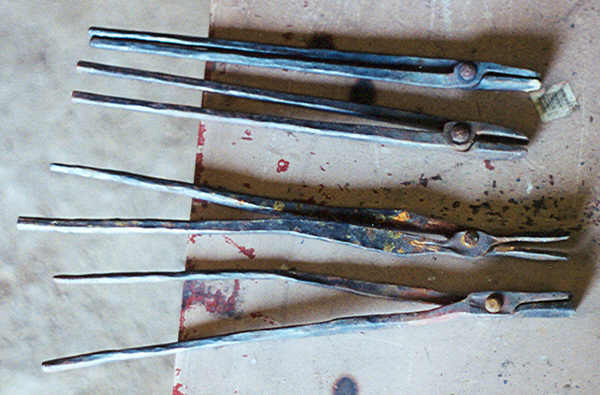 Light tongs are about 2/3rds the size of the regular heavy tongs used by blacksmiths and about half the weight. Light tongs are very comfortable for handling light forgings such as knife blades, horseshoes, and other small items. Below is a photo of a pair of light tongs made by a student at a recent class. These tongs are perfect for handling light items such as the gargoyle dagger in the photo. Yes they can be made. And yes beginners can learn to make them very easily. Many new and aspiring blacksmiths are forever wasting time at flea markets looking for a pair of tongs because they are afraid they can't make tongs themselves. It is easier to do than the beginner may think. I have taught numerous smiths to make them. Some of the results can be seen in the photos on this page. 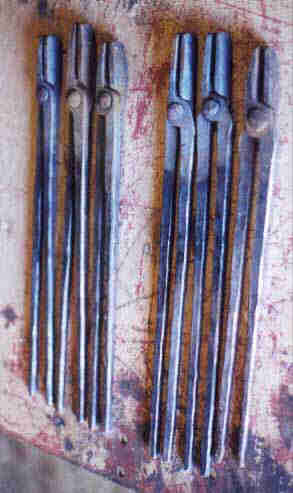 These are good tongs that the smiths will take with them and use to make more tongs for themselves at their home shop. What to bring. Students need to bring hammers if they have them. However there are two complete forging stations with tools at this shop so there will be tools for a couple of smiths. What kinds of hammers? Cross peens types are the best for this class, in the 2 lb. to 3.5 lb. range. Need both if you have them. Ball peens will work also. No claw hammers. We have all the tongs needed as well as other supplies. Participants must bring their own safety glasses, goggles or face shields. Gloves will not be permitted. Fire tools are needed for this class. Students of the Basic Fire Tool making class should bring their fire tools to this session. Also anyone with forges would be appreciated if they brought their forges with them. Cost of this class for SCA members is $30.00. Due to the high price of materials and supplies when we run this class again the cost of the class may be higher. Quality and workmanship are stressed in these classes! Students had better be willing to give their very best effort during these classes. Nothing less will be tolerated. See two photos at left. The photos show two groups of tongs. Two pairs of tongs made by students of the author (the student's tongs turned out even better than the instructor! ), and two pairs of tongs made by students that paid a lot of money to learn from people that claimed to be experienced blacksmiths. My classes are very intensive. I demand good work. As suggested by the photos at left, other instructors don't seem to care what their students learn. I do. 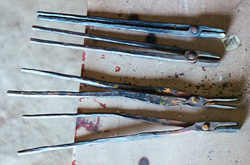 The tongs and dagger in the photo (above right) were the first attempt at forging tongs by the most recent student of past classes. And a better set of tongs was made by another student that had never worked with hand tools before- a success despite having no prior blacksmithing experience. I don't just expect good work from my students, I demand it. Neither do I buy the crackpot story that forging good tongs is beyond the skills of a beginner. Good tongs are very simple to make. In our classes every step of forging is first demonstrated for students in an "I do- you do" format. Some of the photos on this page document that beginners can in fact, learn this work in one day. Upon completion of this class each student will have tongs as good or better than the pair shown above. Students will leave the class with both confidence in their ability to continue forging tongs on their own and experience in having actually done so. This is how it is done. References for beginners. There are several good references for learning to make blacksmith's tongs. The best example is the last lesson in the book; The Blacksmith's Craft (by CoSIRA, later by RDC, and currently published by The Countryside Agency in Britain). The Blacksmith's Craft teaches in the forging of heavy blacksmith tongs made by hand (no power hammer use). The next lesson is discussed in a book called Plain and Ornamental Forging by Ernst Schwarzkopf, though there are no pictures such as found in The Blacksmith's Craft. Plain and Ornamental Forging teaches heavy tongs using many of the same methods as found in The Blacksmith's Craft. Another book specifically describing the forging of light tongs can be found in Kunstschmiedepraxis by F. Wolf ISBN 3-8712-8021-6 published 1974(Text is German & French only), but be warned that Kunstschmiedepraxis assumes that the smith has an air hammer or power hammer, and the techniques require a few special fullers made for working with an air hammer. 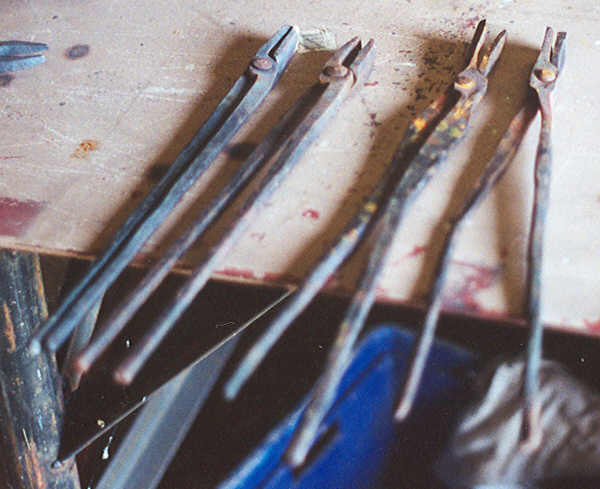 However if the smith uses the same hand forging techniques as found in The Blacksmith's Craft, and applies these techniques to the light tongs found in Kunstschmiedepraxis, the result will be identical to the example of this authors light tongs in the left side of the picture at the top of this page. ***The Countryside Agency - http://www.countryside.gov.uk/LAR/archive/publications/craftpublications.asp (New Link February 2007) BEST LINK ON THE INTERNET! Some of the books from the CoSIRA book series are available for free download. Take advantage of this one while you can, this generous offer might not be available forever. Books include The Blacksmith's Craft, Ornamental Ironwork, Decorative Ironwork, The Thatcher's Craft, The Blacksmith's Manual Illustrated by Lillico, Catalogue of Drawings: Wrought Ironwork Gates, Catalogue of Drawings For Wrought Ironwork, Catalog of Drawings: Weathervanes, and others. These are some of the greatest books ever published- and they are available for free download! Free download for The Blacksmith's Craft! Recently a reader alerted me to news that The Countryside Agency has begun offering The Blacksmith's Craft as a free PDF download. I verified this out and found that they are indeed offering this book for free along with a large number of other titles of interest to blacksmiths. I urge everyone to get this book and also download The Blacksmith's Manual Illustrated as a reference for using large air hammers or power hammers if the smith upgrades his shop at a later date. These books can be found by searching their website here: http://www.countryside.gov.uk Click on the Publications link in the navigation bar and then in the search window, type in Blacksmiths Craft. Note that other books of interest to blacksmiths are also available but I don't know what page to find the listing on at this time. The Blacksmith's Craft is found at a variety of book sellers including Centaur Forge, Norm Larson Books, and Amazon.com. Kunstschmiedepraxis is found at Centaur Forge but may be currently out of print. Plain & Ornamental Forging is found at Centaur Forge, Norm Larson Books, and Amazon.com. Latest update December 30, 2008. Under construction. August 26th, 2001.